Aiming to kill the thousands of germs that live on your smartphone and make some money from germophobes, Japan's Kyocera has developed a phone that can be washed with regular hand soap. The phone, which will go on sale on Dec. 11, can be washed with conventional foaming hand soap of the type found in many kitchens, according to the manufacturer. Of course, soap can be used to clean just about any smartphone currently on the market and waterproof phones are easier to clean, but many won't stand up to repeated rinses with soap and water. That's where this new phone differs. On Thursday, cellular carrier KDDI released a video showing the phone falling into the tomato ketchup sitting on top of a plate of Om Rice, a Japanese kids favorite made from egg and rice. In the video, mom comes to the rescue and cleans the phone and rinses it clean. Several studies have found smartphones to be especially dirty pieces of equipment, covered in bacteria because of the wide number of places they are taken and the numerous surfaces they are placed upon. The phone has another special feature: a bone conduction speaker. When the phone is held to the side of the user's head, vibrations created in the phone travel along bone and cartilage into their ear. The result is a sound that's as clear if not clearer than that from a speaker. The technology has advantages especially in noisy environments. 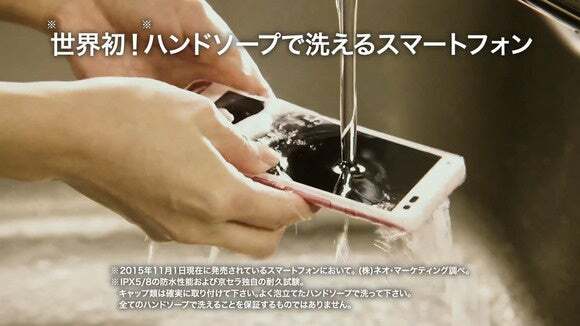 Kyocera's Digno Rafre smartphone is shown in a promotional video begin washed with soap. The phone is a fully featured smartphone running Android 5.1 and with a 5-inch display and 16-megapixel camera. It will cost around ¥57,000 (US$464) in Japan and there are no plans to release it overseas.